10 x 14" with 20 pages of Twinrocker papers. Limited to 50 numbered copies plus 16 A to O. SIGNED on colophon by Hill. This is the first in a planned series of number books in which various artists will be asked to make a series of drawings on themes of their own choosing - the only requirement being that this series deal with an increasing amount of some thing or things (one shin, two bright eyes, etc). 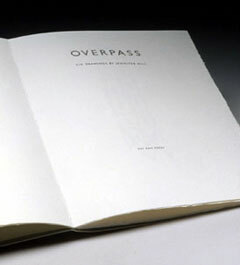 Overpass contains six drawings of Jennifer Hill's imagined structures. Hill's original drawings were reincarnated as polymer plates, printed on Kat Ran presses, and then further embellished by the artist with considerable amounts of pencil. Copyright © 2008 Vamp & Tramp, Booksellers, LLC. All rights reserved.